Ok, so I am a little bummed that there are no Chick-Fil-A's around me. None. When we travel near one, we always visit because their food is so amazing! Love them. I also love coffee...hot or cold. :) So, because I can't get to one, you will have to enjoy this freebie for me if you have one near you. Ok? Thanks. 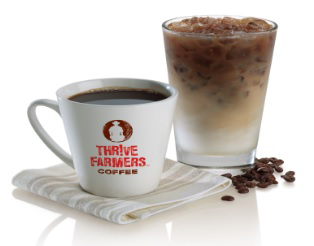 Chick-fil-A restaurants nationwide will give customers free cups of its new specialty-grade THRIVE Farmers™ hot or iced coffee all day long, during the month of February. No purchase necessary! This offer includes 12 ounce (small) hot or 16 ounce (medium) iced sizes and is available while supplies last. The offer is available anytime during regular restaurant hours and is limited to one cup of coffee per customer, per visit. No additional purchase is necessary and no substitutions are available.